The CoroDrill® 400 and CoroDrill® 430 Drills are offered in N1BU solid-carbide grade and are used for machining of components in medium-to-large volumes. The CoroDrill® 400 comes with three flutes to increase stability and holding true position. The units are available as standard products in 5, 6.8, 7, 8.5, 10.2 and 12.5 mm diameters that correspond to M6, M8, M10, M12 and M14 thread sizes. These drills with grades are optimized for ISO N materials to deliver enhanced precision, high repeatability and improved process security. 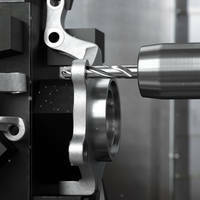 Two new drills optimized for drilling aluminum automotive parts have been developed by cutting-tool and tooling-systems specialist, Sandvik Coromant. Ideal for the machining of components in medium-to-large volumes, CoroDrill® 400 and CoroDrill® 430 deliver higher throughput and lower costs, as well as extended tool life and enhanced process security. The drills are supported by CoroTap® 100, 200, 300 and 400, which are also optimized for tapping operations in ISO N materials and help provide a complete hole-making offer from a single source for those tasked with producing aluminum automotive components. While both CoroDrill® 400 and CoroDrill® 430 are available in the Sandvik Coromant N1BU solid-carbide grade, the former can also be selected in the new N1DU veined polycrystalline diamond (PCD) grade. N1DU provides PCD across the entire cutting edge, thus offering much longer tool life. Due to PCD’s low coefficient of friction and high conductivity of heat, the tool’s cutting edges are less susceptible to built-up edge (BUE). As a general guide, Sandvik Coromant recommends the use of the solid-carbide grade when the hole count is low and handling risk is high. Conversely, the PCD grade is preferable when the hole count is high and higher productivity is required. CoroDrill® 400 is recommended for drilling into solid material, as it features more flute volume for better chip evacuation. When drilling into cored material or pre-cast holes, CoroDrill® 430 will perform better, as it features three flutes for increased stability and holding true position regardless of misaligned cored holes. Optimized features of CoroDrill® 400 and CoroDrill® 430 include polished flutes and precision coolant holes, with support provided for MQL (minimum quantity lubrication). The drills are conveniently available as standard products in 5, 6.8, 7, 8.5, 10.2 and 12.5 mm diameters, which correspond to M6, M8, M10, M12 and M14 thread sizes. Tailor Made options can also be specified for other applications. The new tools belong to the Sandvik Coromant Solid Round Tools Optimized range, a unique line of refined round tools for specific needs that provide extreme efficiency, reliability and durability. Customers should select the Optimized range when a dedicated tool is required for a specific material or application. Supporting the drills are CoroTap® 100, 200, 300 and 400, a series of taps that is also designed specifically for use in ISO N materials.CoroTap® 100 is straight-flute tap for through and blind holes that features interrupted threads for less torque and increased coolant penetration. CoroTap 200 is a spiral-point tap and CoroTap 300 a spiral-flute tap for through and blind holes respectively. These taps are available as high helix (35°) uncoated variants for low Si content aluminum, or low helix (15°) coated or uncoated types for abrasive, high Si content materials. CoroTap® 400 is a forming tap for through and blind holes that features optimized lobe and thread lengths to reduce torque in aluminum workpieces. For more information please visit www.sandvik.coromant.com/en-us/products/corodrill_400_430/Pages/how-to-use.aspx;www.sandvik.coromant.com/en-us/products/pages/tapping-tools.aspx.